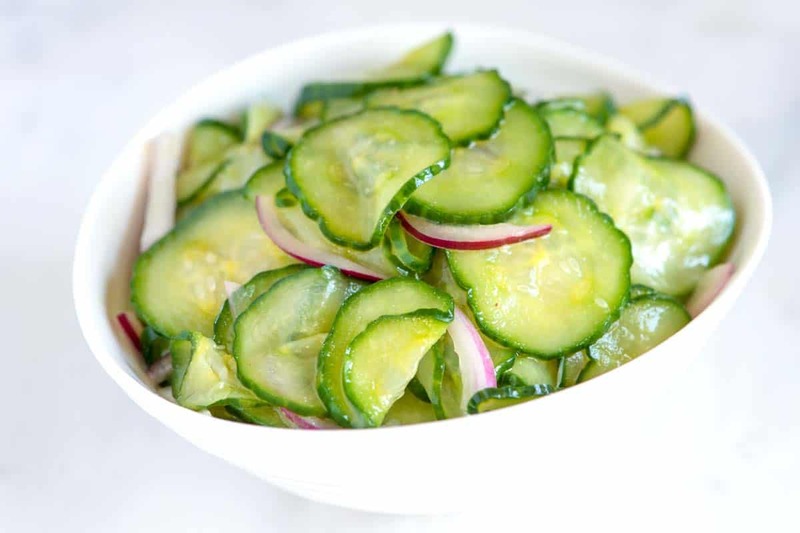 Who doesn’t love a cucumber salad on a hot day? They are so refreshing and – if you make them right – they are so very yummy. Not to mention, healthy!! 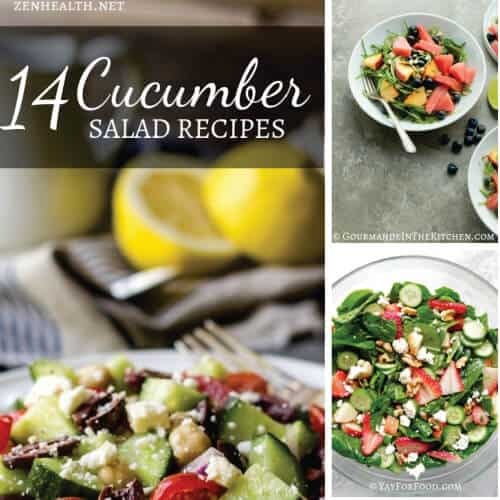 I have some favorite cucumber salad recipes so I thought I would share them with you. If you like any of them, give some love to the gals (and guys) that shared their recipes with us. This one from Joanne of InspiredTaste is super easy to do. She recommends salting the cucumbers beforehand to remove excess moisture. That takes a little time, but it is so worth it. Mix in red onions, vinegar, sugar and Dijon mustard and you’ll get a sweet-tangy salad that gets better with time. It really does! And it’s just the simplest, easiest salad that you can do beforehand on grill day or for a dinner party. 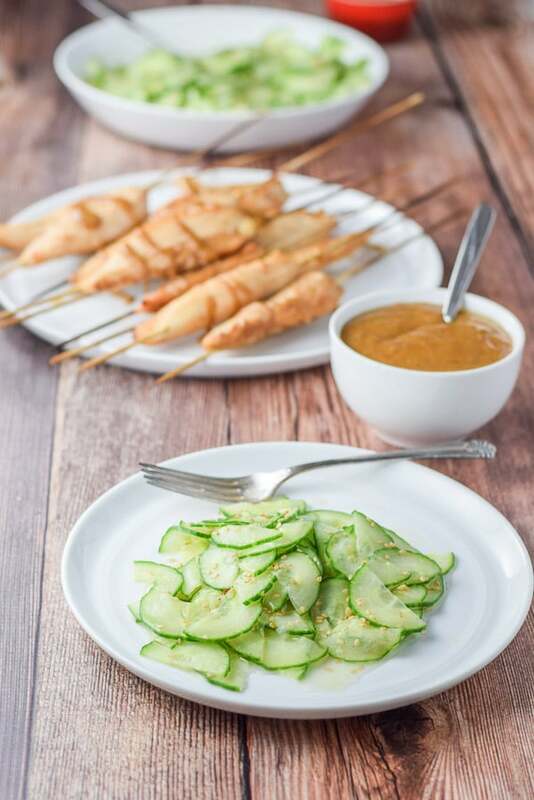 Elaine’s Thai-inspired cucumber salad also gets better with time. And it pairs so well with any Asian dish. I’ve had it alongside teriyaki chicken noodles, spicy shrimp wantons, and veggie chow mein. Elaine’s salad has ginger paste, garlic paste, rice vinegar, sesame oil, sesame seeds, maple syrup and pepper. Don’t you just love that flavor combination? It’s a favorite of mine. When I’m making Asian dishes with little or no sauce, I like having JinJoo’s oi muchim (Korean cucumber salad) on the side. 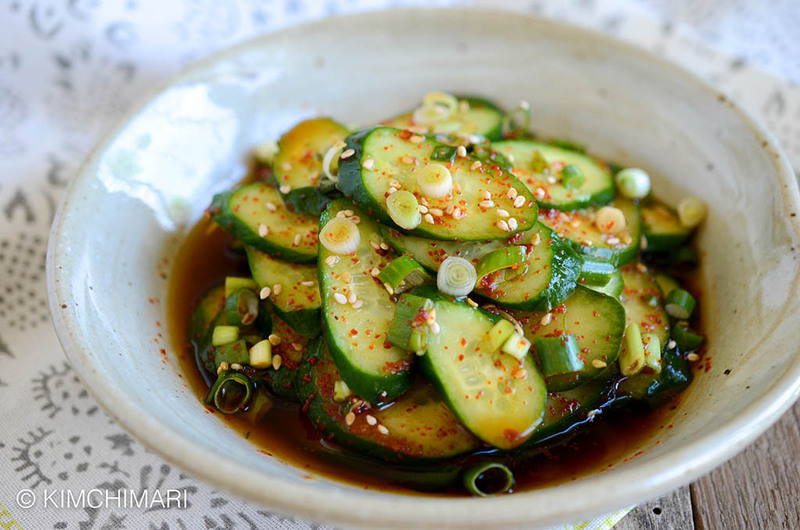 It has cucumber and a tablespoon each of soy sauce, rice vinegar and sugar. It acts like a salad and sauce in one in my house. If Asian food isn’t your cup of tea – sorry, cup of salad, then try this InspiredTaste’s recipe. It’s Greek-inspired and delicious! Don’t forget to salt your cucumbers for an hour or so before (like #1). Once that’s done and rinsed off, just throw in red onions, plain Greek yogurt, lemon, garlic, dill and pepper. Done! It’s so herb-y, fresh, and easy! Before I tried this recipe, I had no idea what jicama was. But I did manage to get my hands on some and I loved it. It’s a root veggie that tastes a little like apple. Trust me, it’s so, so good. 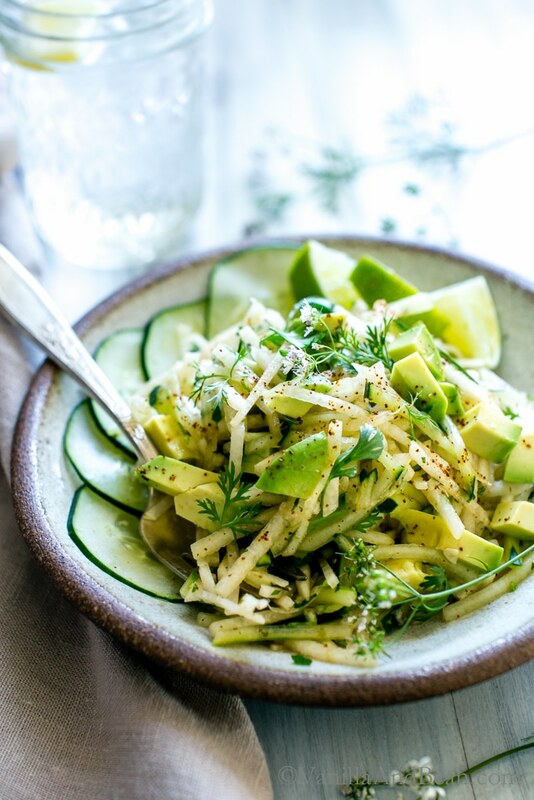 If you can get jicama, then try this recipe from Traci of VanillaAndBean. She adds in avocado, cilantro, lime juice, and a lot of pepper. She definitely spices it up and makes it so gooood! Then you are going to love Natalie’s! It’s so fresh, sweet and flavorful! She uses pineapple, cucumber, bell peppers, red onion, cilantro, lime juice and seasoning. The lime juice really brightens the pineapple, which counters the onion so well. And that cucumber sure keeps it refreshing and yummy! My mouth is watering now! If you can get your hands on fresh mangoes, then you have to try Shinee’s recipe! It’s refreshing, tropical and has an Asian twist. It has cucumber, mango, cilantro, lemon juice, soy sauce, honey, sesame oil, sesame seeds and pepper. All those flavors sound and taste amazing! Ok I must admit when I saw strawberries in this recipe I was totally skeptical. Then I tried it. And it’s good! Really, really good. If my tastebuds could talk, they’d say Marie is a genius. Heh! Marie’s recipe has spinach, cucumber, strawberries, apple, feta, and walnuts. The vinaigrette is all about apple cider vinegar, honey, mustard and seasoning. It’s fresh, packed with fruits and veggies, and has such a brilliant contrast of flavors. I’ve served it with pan seared salmon and lean grilled chicken breast. This one from Seasonal Cravings is a favorite summer salad in my fam. It celebrates all the summer flavors. Watermelon, cucumber, avocado, lime and mint! And feta and pistachios give an incredible salty contrast to the sweetness of the watermelon. Oh, how I miss summer! Sobs! Also, check out all the benefits of eating watermelon! Hint: it’s loaded with antioxidants! Honeydew melon is another classic summer fruit. Did you ever think of adding it to your cucumber salad? Lizzie did! She threw together the melon, cucumber, pecans, honey, lime and mint. Doesn’t that sound lovely? I’ve made her recipe a couple times last month. It’s a great stand-alone salad. But I’ve also paired it with stir-fried veggies, shrimp and fried chicken. Sylvie’s salad recipe is so unique and interesting. 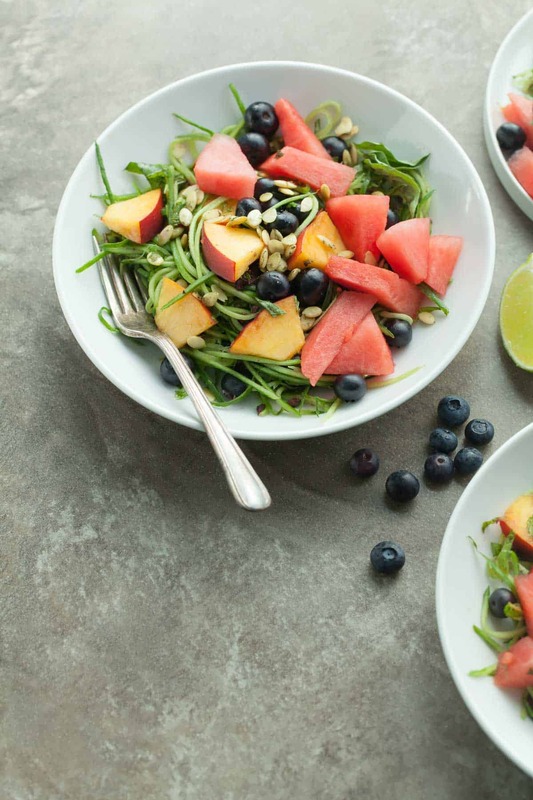 She uses cucumber noodles, olives, peaches (or nectarines), blueberries, watermelon, pumpkin seeds, lime, olive oil, and herbs like basil, mint and green onions. Look at all those colors! 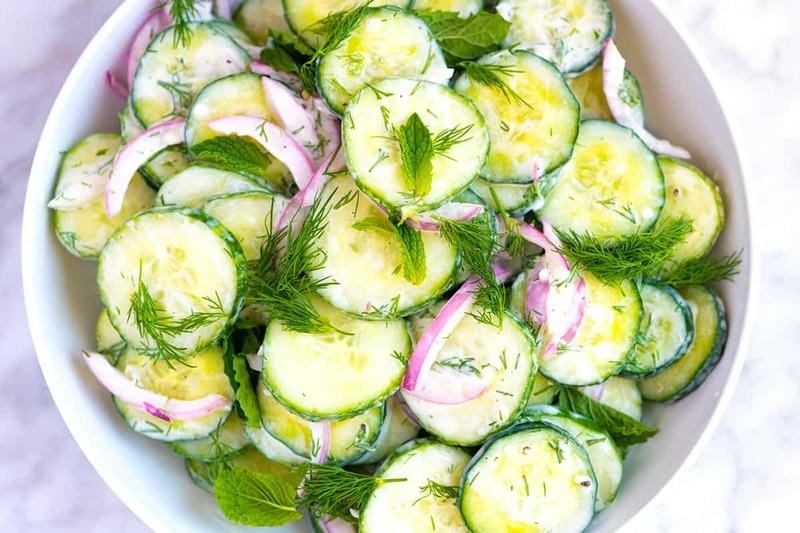 Mary Ann’s Mediterranean cucumber salad tastes as good as it looks. She uses cucumbers, red onions, Kalamata olives and tomatoes. 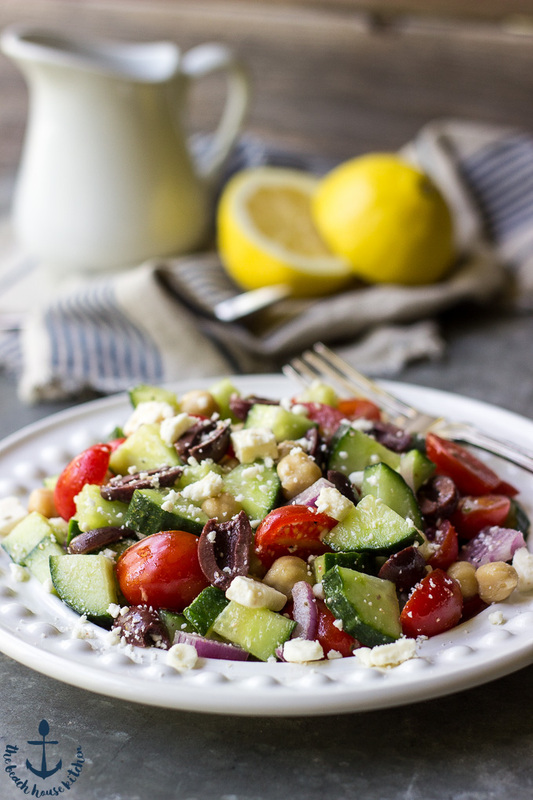 Chickpeas add protein to the salad and the feta gives a wonderful, salty contrast. Oh, and her vinaigrette with olive oil, lemon juice, vinegar, sugar, and garlic just brings everything together so perfectly. 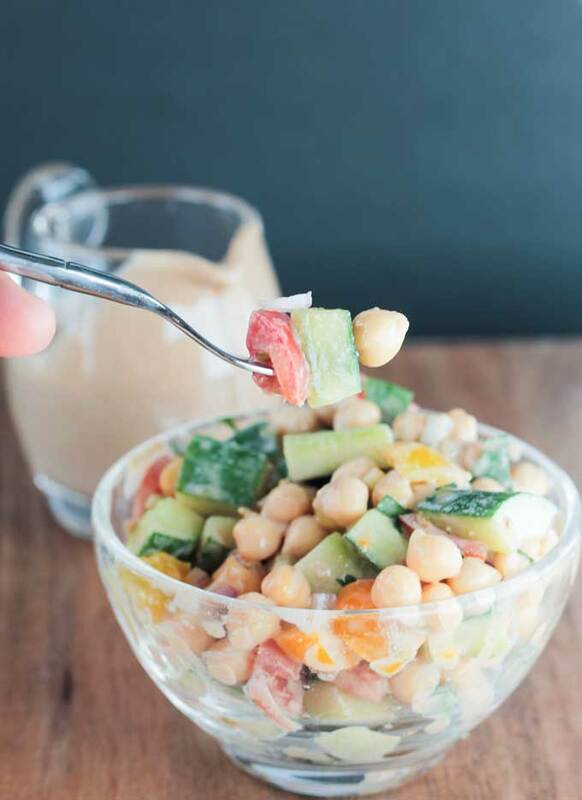 Jenn also has chickpeas in her cucumber salad … and tahini!!! I love tahini and I’m always looking to find new ways to use it. Thanks Jenn! 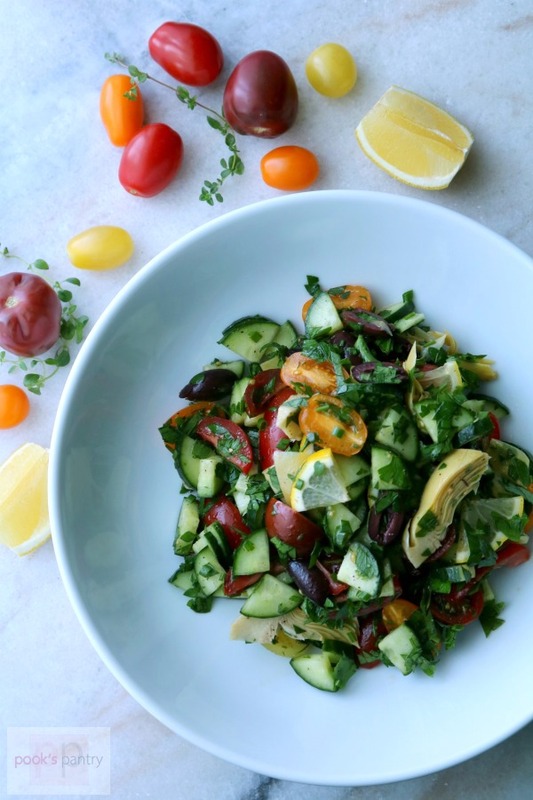 Her salad has cucumbers, tomatoes, red onion, chickpeas, tahini, balsamic vinegar, lemon, and garlic. Chickpeas, tahini, lemon and garlic are basically the ingredients for hummus. So the salad is like a deconstructed hummus with cucumbers and other veggies. Haha! The salad works really well with kebabs! Trust me! I think I’ll end my list with Cheryl’s cucumber salad recipe. Like Mary Ann’s, hers has cucumber, tomatoes, and Kalamata olives. She also has marinated artichokes, lemon, lots of herbs like parsley, thyme, rosemary and chives, and olive oil. I haven’t tried this yet. It’s on my recipe to-do list. But the whole combination of ingredients sounds like a salad my family will absolutely love! That’s my list. What did you think? Let me know in the comments. And don’t forget to give some love to the gals who shared their recipes. 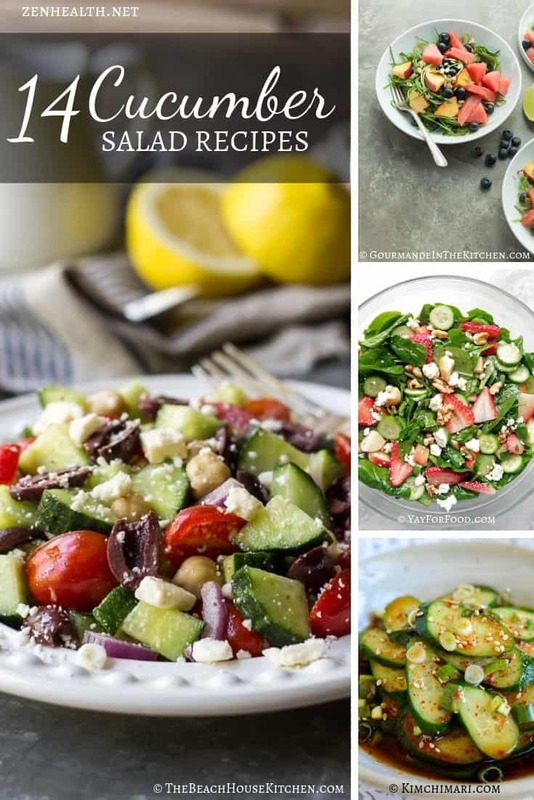 I’m a sucker of salads and all these salads looks delicious and refreshing, especially that cucumber fruit salad is definitely worth trying. Thanks for sharing. Your salads look delicious, I especially like the sound of the cucumber and fruit salad. I’ve never through of it before but definitely one to try. Must be a lovely combination! These all look absolutely delicious, I am going to try a few out! So glad to find this collection ! Perfect for my office lunches ! Thank you so much !